When deciding to stream your favorite game Fortnite, PUBG, League Of Legends, or whatever it may be there is a small predicament. Whether you are on the Xbox One, PS4, Mobile, or PC you have the options to stream with Twitch, Mixer, or YouTube. If you are not a console user you probably never heard of Mixer. Well it is a streaming app, just like Twitch and YouTube. The platform is made by Microsoft, so it is natively already on the Xbox. Twitch is also a streaming platform, that you may have heard about. As it is becoming more mainstream now. Of course we have YouTube which we all have a love hate relationship with. 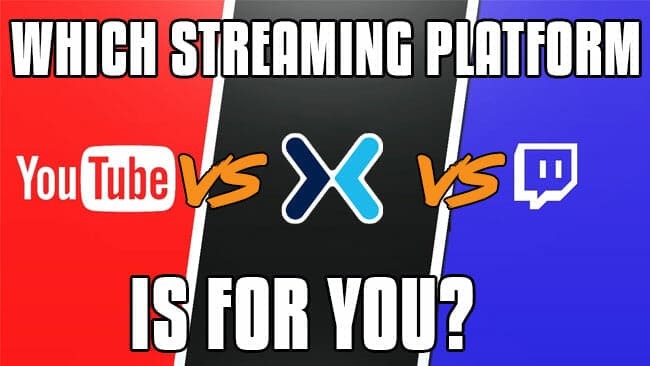 So which platform should you use for streaming, Twitch or Mixer? Built in interactive features that are fun for the viewers and streamers. Low latency to keep the lag on stream down. Very large and growing audience. YouTubers are jumping ship to it, or at least using the platform for more reach. No real-time DVR, you have to go back into the VOD to see a replay or backtrack a bit. Okay, but which platform should i choose Mixer, Twitch, or YouTube? Well that may be hard to choose, but with the listed pros and cons we can break it down a little further. Do you plan on streaming on all the platforms? If yes then Twitch is definitely going to be your favorite option. Since it is capable of streaming easily on all the gaming and IRL platforms. I already have a YouTube following. Then this is a no brainer, stream on YouTube, your audience already knows where you are at. The second option though, is to stream on Twitch and edit the Twitch VOD’s and upload those to YouTube. As it is always better to keep a little bit of diversity in your income. Never allow one platform to be your main source. My opinion and personal preference would be to use Twitch. It’s a growing platform and is still bit of a wild wild west in terms of how it is becoming more mainstream. If this was a few years ago I would of said YouTube, but it seems that YouTube is so big that it is hard to support the small channels, and keep the spam out. As their algorithm is so weird and clearly favors the flavor of the month. Like right now YouTube is feeding everyone Fortnite videos. I don’t even watch Fortnite videos and it is there in my feed. Similar to all the Jake and Logan Paul videos that show up, I only ever thumbs downed there videos and they still show up. All the platforms have their pros and cons. Your hard work and dedication will definitely determine how successful you are on any of them. Overall I believe that as of right now with the state of streaming that Twitch is the go to platform. And that we all should be on Twitch, plus it’s a lovely way to give YouTube motivation to do better and stop pushing the trash that they have been pushing lately.